20 students from Central attended the Oklahoma Technology Student Association state conference in Norman on April 10-12, 2019. The students competed in 11 different areas. 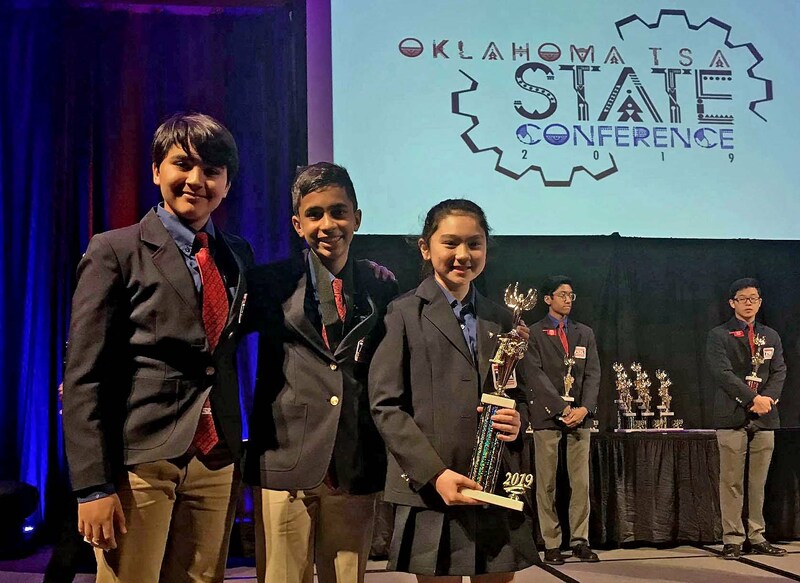 Mehdi Achour, Om Ghonasgi, Craig Griffin, and Lily Talbot qualified at the state conference to go on to compete at the national conference, which will be held in Washington, DC in late June and early July. The Central VEX Robotics team made it into the finals competition of the top 16 teams. The school also had students compete in Challenging Technology Issues, Problem-Solving, T-Shirt Design, and Drones. The Central teams were under the direction of Central's Gateway to Technology STEM teachers Lolly Williams and Darin Messerli. 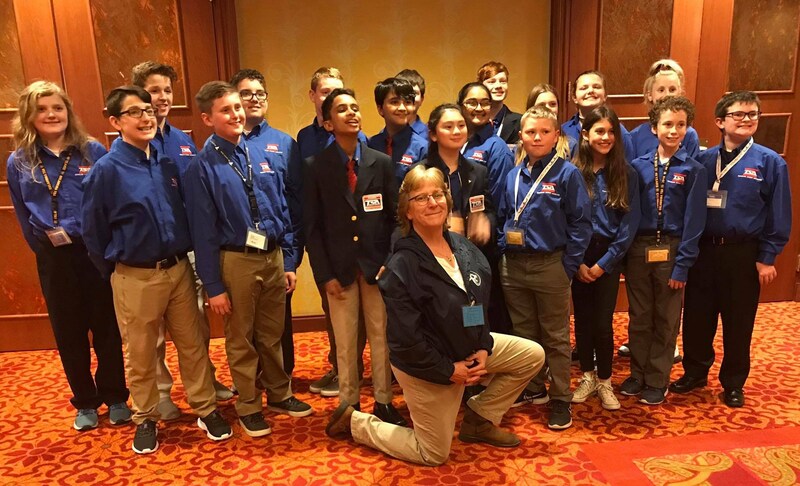 Students from Bartlesville High School and Madison Middle School also attended the conference, with one student at BHS also qualifying for nationals. Mehdi Achour, Om Ghonasgi, and Lily Talbot earned 1st Place in Middle School STEM Animation at the state conference and qualified for nationals. 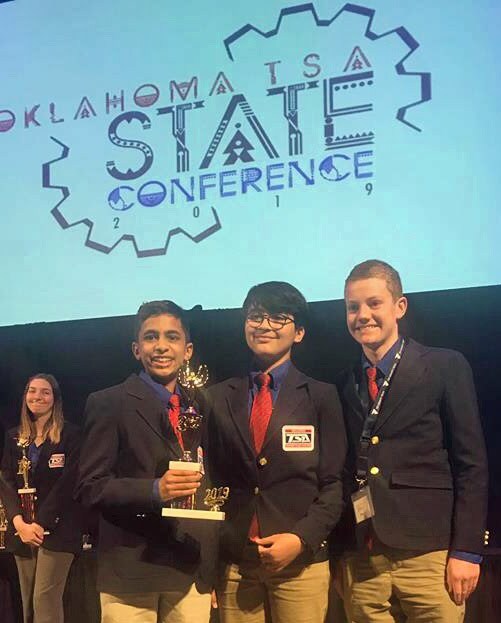 Om Ghonasgi, Mehdi Achour, and Griffin Craig earned 3rd Place in Leadership Strategies at the state conference and qualified for nationals. In the Rube Goldberg competition, students spent four hours building three boards with six simple machines in each; the Central Middle School students were 4th Place in the state. Central sponsor Darin Messerli coordinated that event. Central students at the Technology Student Association state conference with sponsor Lolly Williams. Darin Messerli and Lolly Williams teach the PLTW Gateway STEM courses at Central Middle School, and Central hosted a robotics tournament this year. Like Central, Madison Middle School was also named a Distinguished School for its Gateway program in both 2017-18 and 2018-19. Rachel Hough and Shannon McKinney teach the PLTW Gateway STEM courses at Madison Middle School. Shannon is a PLTW Master Teacher and also chairs the district's STEM department. Students at Central and Madison take their Gateway courses in the Phillips 66 Innovation Labs at each middle school. The foundation built in the middle school Gateway programs are helping students excel in high school. Bartlesville High School (BHS) is the only comprehensive high school in Oklahoma to be named a Distinguished High School in the Project Lead the Way STEM program. The four other state schools to receive that honor are all CareerTech centers: Tri-County Tech in Bartlesville and technology centers in Drumright, Norman, and Stillwater. In partnership with Tri-County Tech, Bartlesville High School also offers two Pre-Engineering courses in its Phillips 66 Innovation Labs, taught by BHS teacher David Ayres. His students then have the option of taking additional courses in that field at Tri-County Tech, which is also a Distinguished School in PLTW. This year the middle school programs began receiving students who completed a STEM computer science modules in fifth grade in 2017-18. And all of the students in kindergarten through fifth grade at each of the district's six elementary schools are completing two PLTW Launch STEM modules this academic year: one in computer science and another in biomedicine or engineering. The Bartlesville Public Schools Foundation, in conjunction with ConocoPhillips, ABB, and other sponsors, has funded the elementary STEM program. The Foundation is currently raising a final $100,000 in funds to provide two more modules for all kindergarten through fifth-grade classrooms to be implemented in 2019-20 and 2020-21, focused on engineering topics. Student John Alexander Ortiz has been named Central Middle School's champion in the annual Geography Bee. Both Ortiz and Madison Middle School champion Jacob Duhon made it into the top 100 for Oklahoma, so they will compete in the 2019 National Geographic GeoBee Oklahoma State Competition in Norman on March 29, 2019. Beginning in August 2019, Bartlesville will begin offering agricultural education courses at the middle schools and high school. The Board of Education will consider naming Marty Jones as a new agriculture teacher at its meeting on March 11, 2019. The district's 2020 Strategic Plan includes a Community Partnerships component. That led to a districtwide staff survey in the 2017-18 academic year for "Big Dreams" about programs and offerings the district might implement with community partners. Courtney Gagan, an English teacher at Madison Middle School who is the district's 2019 Teacher of the Year, suggested a Future Farmers of America (FFA) program. The district determined that almost all of the state's districts with Class 6A schools offer agriculture education. District administrators Matt Hancock and Dr. Stephanie Curtis formed a committee to research state and area agriculture education programs and seek community partners to assist with implementation. Committee members toured programs in Owasso and Jenks and just up the road in Dewey. Hancock and Curtis have presented to the groups such as Washington County CattleWomen and the Bartlesville Public Schools Foundation's Board of Trustees. Community partners are stepping up to assist. Trevor Dorsey and Regent Bank have contributed $10,000 to purchase a trailer for a Future Farmers of America program. The Barry W. Lowe & Karen Sue Lowe Education Foundation has contributed $3,000 to purchase middle school and high school agriculture curricula for 2019-20. The district has identified a spot at Bartlesville High School for a classroom/shop building for the new program. It is likely that in August 2019 voters will consider a bond issue that will include funding for the construction of that facility at the south end of the parking lot near the Bruin Activity Center indoor practice facility. It would not be an animal barn but would provide classroom and shop space. Hiring an agriculture teacher has been identified as one of the district's 2019-2020 Budget Priorities. The district's program will commence by offering an introductory class at each middle school and an Introduction to Agriscience course at the high school in 2019-2020. The instructor will help identify which curricular offerings best suit the needs of Bartlesville students. It is projected that the program might eventually grow to require two agriculture instructors. The Board of Education will consider hiring Marty Jones as the initial instructor. 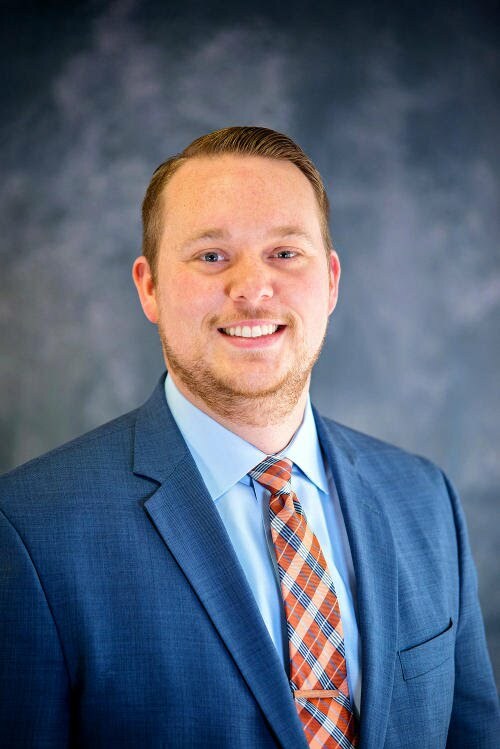 An Oklahoma native, Jones earned a BS in Agricultural Education from Oklahoma State University and was named the Outstanding Senior by the OSU Alumni Association and crowned Homecoming King. He has taught agriculture at Elgin and Guthrie high schools. During his five years of teaching agriculture, his students have done well at the national FFA convention, and he has advised FFA degree recipients, trained students who qualified for district and state competition in speech, and spearheaded a variety of other program achievements. All-State Chorus students Samarah Robinson, Bella Cavaceci, Joyce Yang, William Pendergraft, Kessi Cabler, Brooke Marshall, Emily Nordhues, Hanna Phelps, Sophie Walker, Lane Cabler, Carson Mathes, and Kaimron Schoonover. INSET PHOTO: All-Stater Carlie Pool. Four Central students, along with nine students from Bartlesville High School (BHS), were recognized as Vocal Music All-Staters at the Bartlesville Board of Education meeting on February 18, 2019. Teachers Margie Green, Alex Rivera, and Tamara Walker introduced the students. The Oklahoma Music Educators Association annually conducts auditions for the All-State Chorus of students recommended by local directors. Students must pass a quadrant audition and then a subsequent one to be selected for the All-State Treble Chorus or All-State Mixed Chorus. The students perform at the organization's winter conference. *Emily Nordhues is a three-year member of the OkMEA All-State Choruses. Bartlesville Public Schools is not sponsoring, endorsing, or recommending this event. Student participation is voluntary and subject to parental approval. 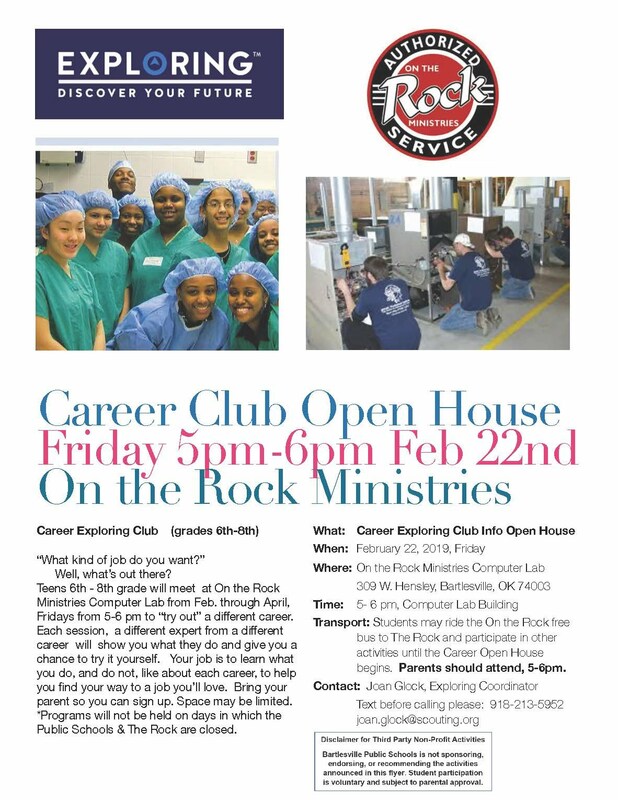 The Exploring program will have a Career Exploring Club Open House for middle school students and their parents at On The Rock at 309 W. Hensley on Friday, February 22 from 5-6 p.m. in the Computer Lab Building. See the flyer below. Contact Joan Glock for more information. In early February the Bartlesville Fire Department brought its Pumper 1 snorkel truck to Central to assist with the annual Egg Drop. About 200 sixth grade students in Ms. Swanson's and Mr. Good's Physical Science classes participated. The students had been learning about invisible forces such as static electricity, gravity, and friction as well as air resistance. The students were charged with designing a container to keep an egg from cracking when dropped from 30 to 60 feet. Teacher Elaine Swanson told Bartlesville Radio that some students spent weeks working on their projects while others threw something together that day before the Egg Drop. The firefighters carried a number of containers up to 30 feet for the initial drops. The ones which survived were later taken up to 60 feet for a second test. While some of the students' projects survived both drops, others had a messy end in the parking lot. Kudos to Ms. Swanson and Mr. Good for organizing the event, and everyone appreciated the assistance from equipment operator Steve Burnett and the firemen up on the lift who made this fun learning experience possible for the students. 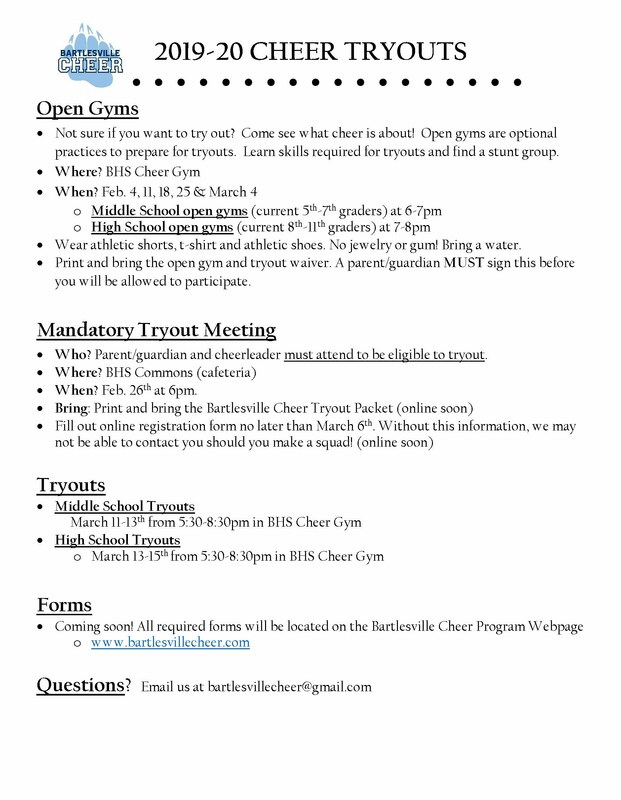 See flyer for information about forms, practices, communication app, etc. Contact Coach Holmes or Coach Vermeire for more information. Brown's Shoe Fit Co. in Bartlesville is offering a 20% discount of the total receipt for all Track & Field athletes. Just mention your participation with the track team at checkout to receive the discount. Celebrate a "Classic" - Central Middle School! 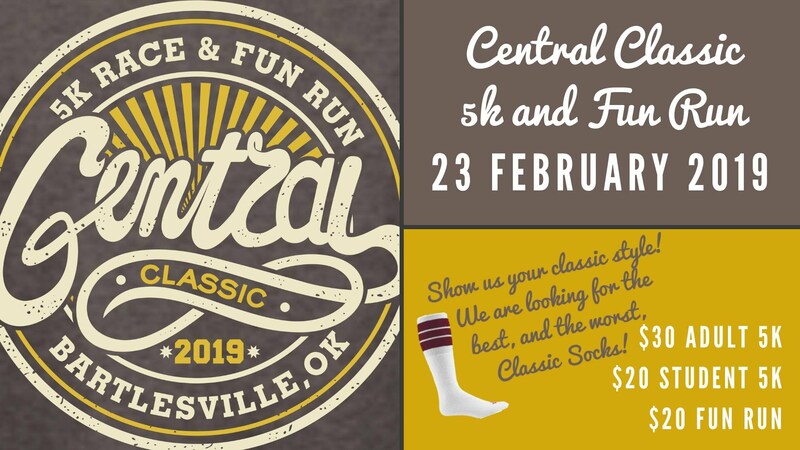 The “Central Classic 5K Race and 1 Mile Fun Run” returns to Bartlesville at 8:30 a.m. on Saturday, February 23, 2019. The event will support continued improvements to the historic building. Previous participants have helped the school completely upgrade the audio/visual equipment in its distinguished auditorium and assisted with the purchase of carpet squares that protect its new gymnasium and make it useful for many events. This is a chip-timed event on a certified course. We hope that you will consider joining Central Middle School for this event in support of Central’s youth and the entire community of Bartlesville.